Just picked this up today and am well chuffed. 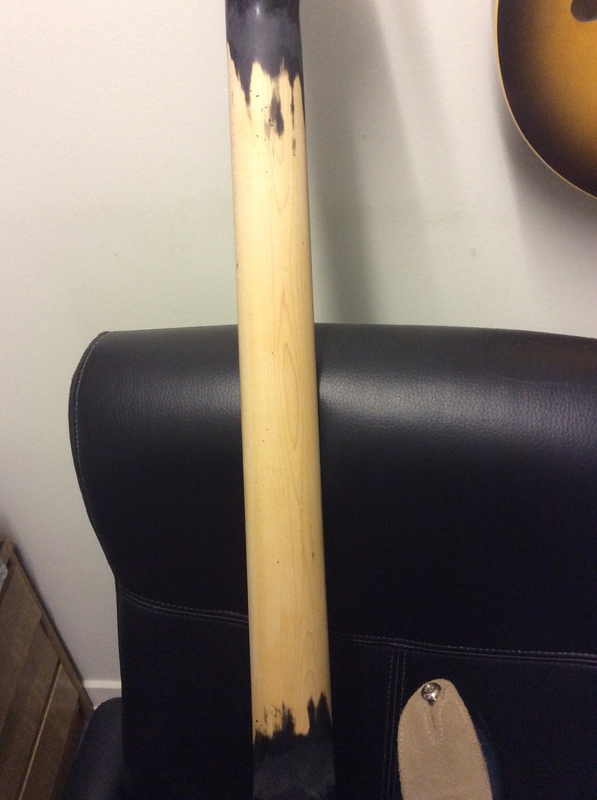 The neck is gonna get sanded asap as the lacquer is kind of half on half off and a bit on the sticky side and I think I might go for refinish on the body. Most probably a sonic blue. i have my brother in law’s 92 Stingray on loan and it’s been nice comparing them side by side. Neck profiles feel very similar. I think there is a problem with the 92 Stingray as it’s much quieter than the Sub, maybe the preamp? Nice basses. I had a 4 but play 5s now. Defo parallel but worth adding a series switch FWIW some owners have used nail polish remover to strip back the black paint on the back and headstock sides. As you plan to refinish the body (poplar) yiu should put in a mild arm and tummy cut. Yeh, I was wondering about doing the body shaping. I’m gigging with it tonight so will get a feel of what it’s like. 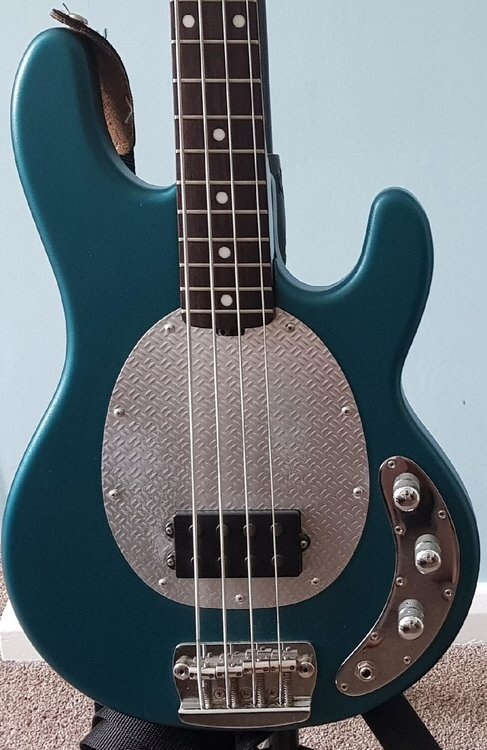 if I go sonic blue, I was gonna put a white scratch plate and pickup cover on. The pickup covers appear to be non existent though. will give the nail varnish remover trick a go! Good thinking, Batman. If the 1992 'Ray that you have been borrowing has a rosewood fingerboard, the back of its neck is probably finished in oil. Probably wisest to do the same to your S.U.B. I might go for refinish on the body. As mentioned by Winny_Pooh, the body will be Poplar. Its grain will probably not be pretty. (This is how EBMM kept the production costs down.) Contouring the body edge might help to reduce the overall weight slightly. The effect that it has on wearer comfort depends upon how high up or low down the instrument is slung on a strap. Personally, I would leave the textured finish on and invest in a scratchplate. I think there is a problem with the 92 Stingray as it’s much quieter than the Sub, maybe the preamp? The usual thing that makes instruments with battery-powered onboard electronics go quiet and, maybe, even a little farty on the side, is a tired PP3. In your photographs, the edges of the pickup polepieces appear slightly rounded over and smaller than I would expect on the regular production line Stingray and Sabre. It is possible that the S.U.B. pickup is of the steel poles and underslung ceramic bar magnets construction. This could make it both louder and more "in your face" than Alnico 5 magnets. If you like the way it sounds, do not change it. re the 92 Stingray. Have tried batteries before but definitely not the issue. A few people have played and compared it to their own stingrays and noted the volume difference. 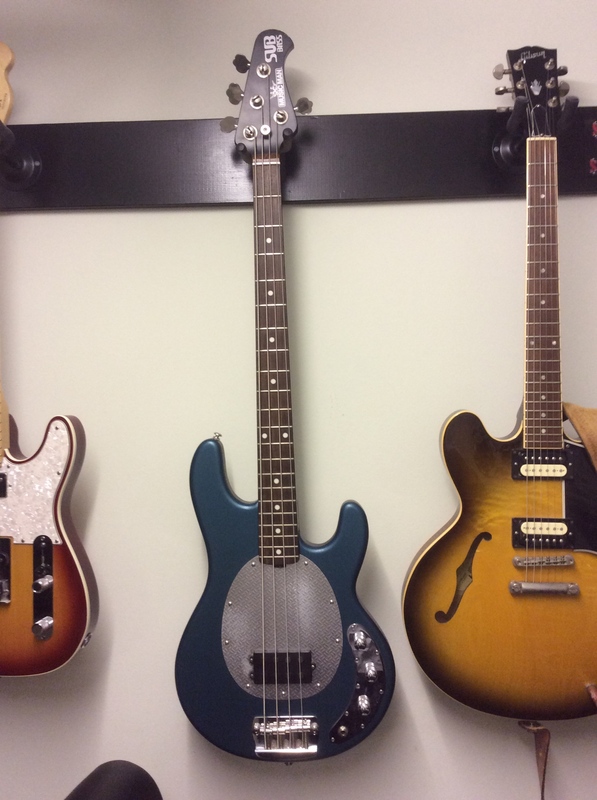 Even my p bass is significantly louder. the pole pieces on both basses measure the same, approx 9mm. Not had chance to whip them out yet to compare internals. And yes will almost certainly go for an oil finish neck. Tru oil or gun stock oil maybe. Will look into this. Any recommendations welcome please! 10 mins with a some 300 scratch and we’re underway. Seems to coming off a treat. It is possible that one coil in the 92's pickup may have died? Hadn’t considered that. Will get the multimeter out and look into it. The regular two coil Stingray pickup has its coils permanently interconnected in parallel but has just two output conductors running to the pre-amp in the control cavity. Hot = white. Ground = black. The coil links are on the underside of the pickup. Thus, to determine which coil may be out of circuit, it is necessary to unfasten the offending pickup. If one coil is either shorted or its ground has become disconnected, it will no longer contribute to the noise-cancellation. The instrument will buzz and/or hum. The onboard EQ will boost this noise.